With the shifting tides of globalisation gathering pace and Brexit on the horizon, the benefits associated with speaking several languages are becoming increasingly apparent. 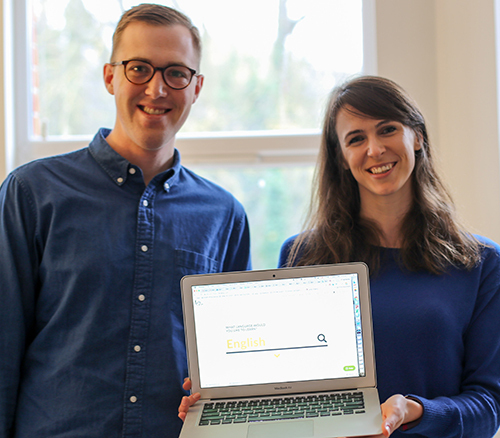 One UCL Masters student wants to help foster linguistic diversity and has made it her mission to make learning a language as easy and accessible for as many people as possible. Agnieszka Nowicka (Cognitive and Decision Sciences MSc) is the co-founder of Langu, a start-up that connects students and teachers from around the world for live, 1-to-1 language lessons in a virtual classroom. Students can choose from a range of languages including English, Spanish, French, German, Italian, Portuguese, Polish, Russian, and Mandarin. The idea for the platform came about as a result of Agnieszka's educational background, including her Applied Linguistics MSc from Oxford as well as her experience teaching English as a foreign language in London and in her home country of Poland. She explained, "After I completed my masters, I spent some time working in a language school in London before I went back home to Poland to work as a language teacher, so I was immersed in a language space. There was a huge demand for my services when I returned to Poland because I had the real experience of living, working and studying in London. "In London there are so many ways to learn a new language with a pool of some of the best teachers available, but what about people outside of the city? How can they get access to language teachers who are best suited to them? So I wanted to create a platform that connected students from all walks of life with top independent language teachers not just from a student's hometown, but from around the world." Despite having her lightbulb moment in 2011, it took several years for Agnieszka and her co-founder Travis Wentworth (who she met while studying at Oxford), to develop the idea into something they could market to students and teachers alike. It wasn't until 2016 that the linguistic duo really committed to developing Langu and began to meet with potential funders to pitch their idea. The feedback to Langu was overwhelming positive and it helped them to continually tweak and improve the platform. Their watershed moment came in April 2016 when Agnieszka and Travis' work finally paid off. Agnieszka said, "We were trying to source funding for Langu while I was in the first year of studying for my masters at UCL as well as juggling a consultancy job at Ernst and Young. It was a stressful period but the turning point came about because of our involvement with Startup Funding Club (SFC) in King's Cross. "Through SFC we met with an investor to have what we thought was just an initial meeting to talk about our idea. Three days after the meeting the funder rang us out of the blue to say that they wanted to invest in Langu. It was incredibly lucky timing, because it turns out the investor was coming to the end of their financial year, so they had to spend their budget quickly. Securing investment gave us the boost we needed. It allowed me to quit my job and commit to Langu." Since sourcing start-up funding things have moved very quickly for Agnieszka. She has since taken on the role of Product Director at Langu in which she has been able to focus on the usability and behavioural design of the platform. Although she concedes that the glamorous job title belies the fact that the nature of working on a start-up means she is the general dogsbody too. Towards the end of 2016, Agnieszka and Travis hired a full-time Chief Technology Officer to improve the speed and features offered by the website. Langu was given a further boost when Agnieszka and Travis applied for and secured free office space in the UCL Innovation and Enterprise Hatchery located in King's Cross London, the student entrepreneur and incubator space available for UCL student start-ups. Having a base in zone 1 and a talented web developer on board meant the Langu website was launched in August 2016. The duo began recruiting teachers from all walks of life who had a passion and talent for teaching, as well as the qualifications to match their enthusiasm. Langu is essentially an in-browser virtual classroom which runs on a technology called Google Realtime API, similar to Google Docs. Students specify the language they want to learn, when, and for what purpose, specifying their current language level. Then the team at Langu match students with the best teachers for their needs. Students book and pay for lessons 24-hours in advance and they can purchase a single lesson (30, 60, 90, or 120 minutes in length) or purchase a package of five lessons. Currently the platform is PC based but there are plans afoot to build a mobile version and possibly an app too. Agnieszka is also exploring the possibility of developing group lessons, which would mean lessons would be cheaper for students. As the start-up moves from strength to strength, the only real blot on the horizon is Brexit. Agnieszka explained, "I know it is going to be a long journey to make Langu profitable and sustainable but with a start-up the sky really is the limit. "However, we are considering what impact Brexit will have on the business. For example, Brexit could mean that if we stay in London we will have to think about the higher costs incurred in hiring staff from outside the UK, as well as certain tax implications if we're outside the single market. We want to make it work here in the UK, but other options are tempting - Berlin, for example, has a great start-up scene and it is so much cheaper than London, so it has a lot to offer." Despite the obstacles that Brexit may throw up for Langu in the near future, Agnieszka is determined to make the most of living and working in London and is encouraging her fellow UCL students to do the same. Agnieszka said, "UCL has such a broad network of talented students and there are so many opportunities to collaborate. My experience has taught me that if you have an idea you need to speak to as many people as possible about your idea, and it is important to join start-up clubs and secure as many meetings with potential investors and interested parties. Having those initial conversations about our idea helped us make adjustments so that we could achieve product-market fit. It also helped me to improve my pitching skills. "I would also advise students to approach the UCL Enterprise and Innovation team. The prizes they offer are helpful, but even more important is the advice and guidance they offer, that is truly invaluable." For more information you can contact Agnieszka on aga@heylangu.com or visit the Langu website.